More bits and pieces have been added to our Locost frame. Mostly bits, thoiugh. Only a few pieces. Seat belt brackets and suspension pickups were among the latest additions. 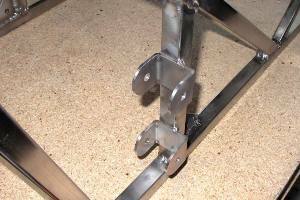 The seat belt brackets used up a lot of filler wire, with triple-padded beads on the inside and even more beads on the outside. They may not be pretty, but at least they won't be going anywhere in an accident. As a matter of fact, we might've even made them too strong. I'm not sure you'd want to be in the car during any sort of maneuver that would tear the brackets loose. 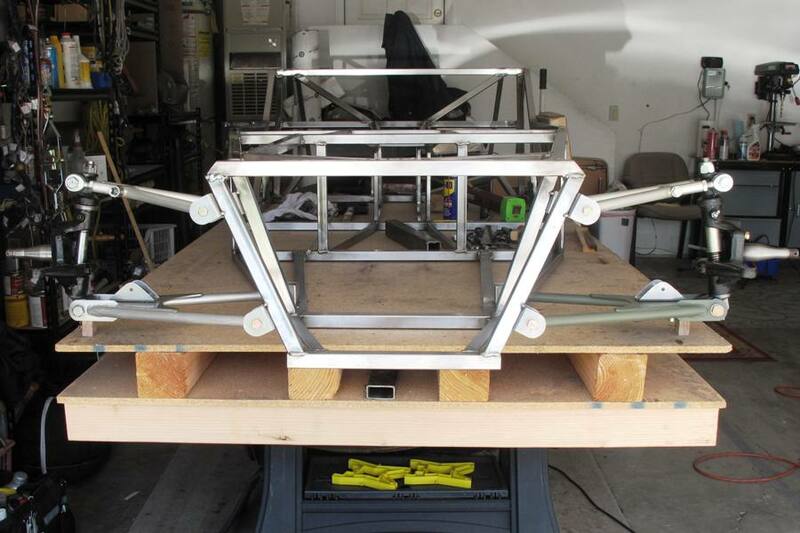 The chassis is getting pretty heavy now. I'd estimate it at around 150 lbs. I can barely move the thing from the table to the floor by myself anymore. Yes, I'm a weakling, but it's not only heavy, it's big. However, the good news is, with most of the attachments out of the way it's starting to feel like most of the welding is behind us, and the era of frame building is drawing to a close. So we're spending more time now with the donor parts, making sure everything is going to fit. So far so good, although there isn't a lot of room to spare. We finally drilled attachment holes in the front suspension shock plates and shock brackets, a job we'd been putting off since January because it looked like it might be beyond our meager but well-documented fabrication skills. However we measured the brackets as precisely as we could, and after drilling 1/4" pilot holes we only had to work with a round file for an hour or so to actually get the holes centered. 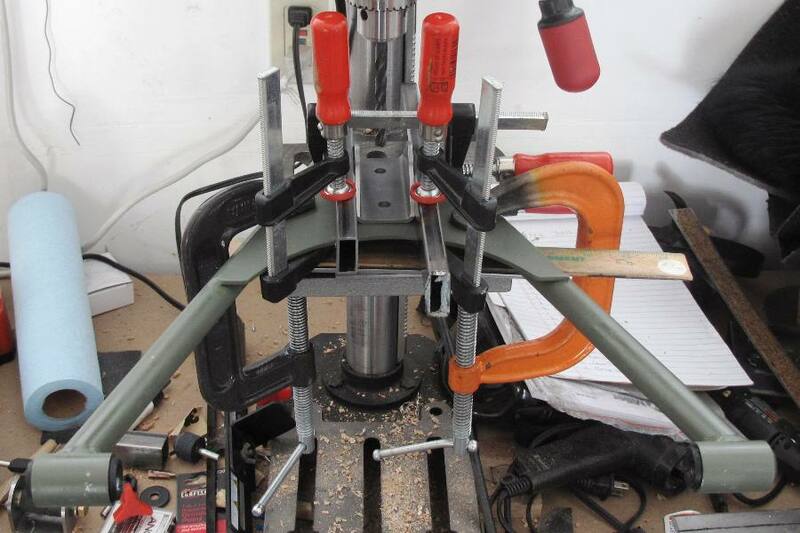 Makeshift jigs (our favorite kind) were then used to transfer the holes to the shock plates, and the brackets are now bolted to the semi-painted A-arms. We'd originally thought that bolting the front shock brackets to the A-arms would be a cool idea, allowing us to tinker with the spring motion ratio by moving the lower shock mounts back and forth. However, now that we've done it, that sounds like way too much work. We now think the shocks will be fine right where they are. Of course the mounts are a little heavier now than they would've been if we'd stuck with the book design and just welded them to the A-arms, but again we have to ask ourselves, how good would that look? Attaching the front suspension to the frame for the first time was pretty exciting. For several years now we've been working on a design to adapt the MGB front suspension to a Locost, starting way back in '06 with the A-arms we built for the mock up frame. Back then we didn't realize that caster had to be built into the design, and we more or less went with the book suspension. Over the years we've refined the design into what you see here, however until last week we weren't 100% sure everything would work the way we drew it up. The fact is, as we've proven on many occasions, anything could've gone wrong. Any one of our measurements could've been miscalculated. Any part could've been built incorrectly. The design itself could've been flawed. So when we bolted the spindle to the A-arms and fed the assembly into the pickups, it was great to see the bushing tubes line up with the brackets, and excellent to see the bolts go in so easily. But the coolest result was when we lifted up the bottom A-arm, and everything rotated freely and easily through a wide range of bump and droop. And just like that, another miracle. 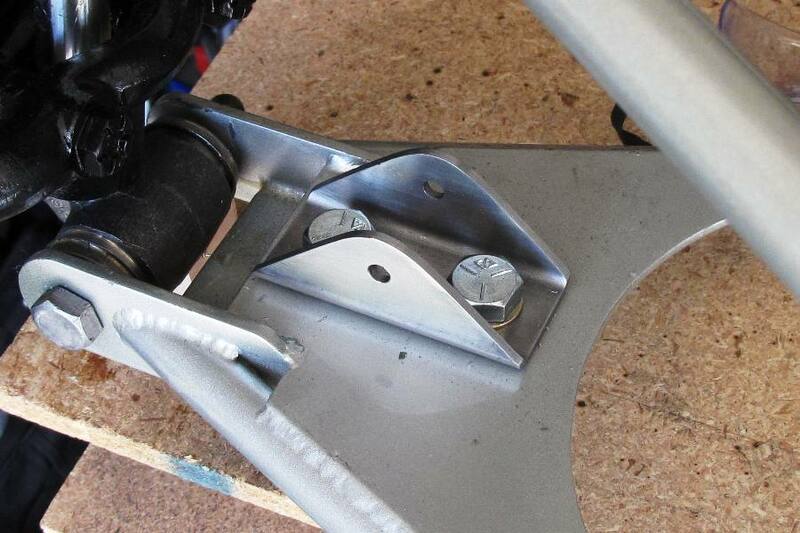 One thing we did fairly late in the design game was modify the lower rear brackets in the front suspension. Brackets like this are supposed to have enough flexibility that tightening the nut and bolt will clamp the bushing so it can't rotate and wear against the bolt. Book brackets are designed to do that, but our lower rear brackets aren't book brackets. So we decided to leave the rear arms of these brackets unwelded, shaving 1/16" off the bottom of those arms so they can be clamped to the bushing and won't rub against the frame when the suspension flexes. We hope it works. The next hurdle in our little project is the rear suspension. We basically have to take the rear axle apart, cut and grind away the old M.G.-style spring perch brackets, and weld on new Locost-style trailing arm ones. 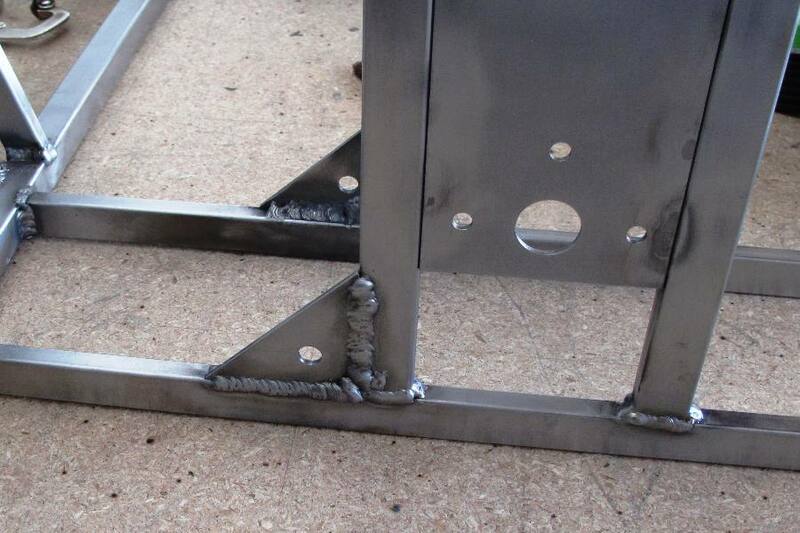 We're not too worried about welding up the new brackets, but we're a little concerned about welding the trailing links. 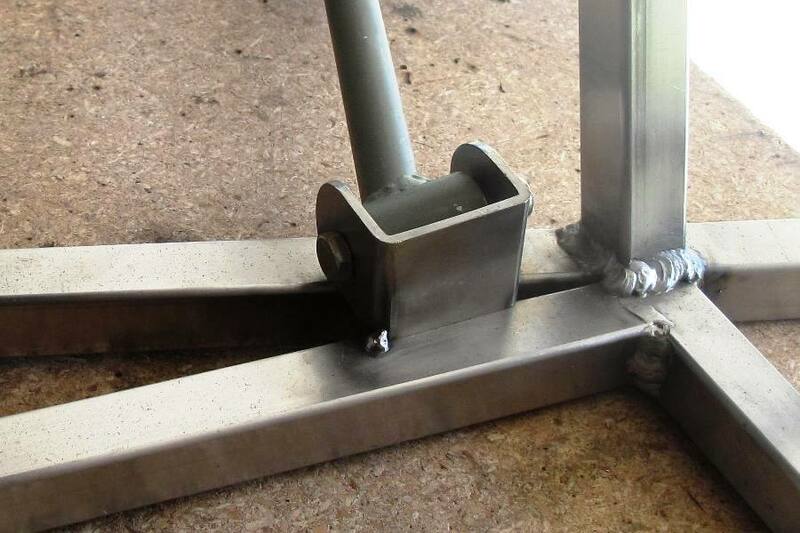 Not that they wouldn't be strong enough if we welded them ourselves, but you know, they have to look good too. So I solicited my old TIG-welding chum and hope to borrow on his expertise in the near future. 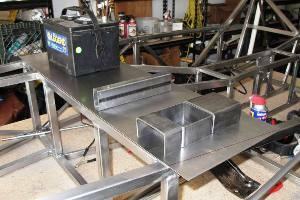 Once we confirm the rear suspension is going to work, I think we'll start building the engine bay shelf. It's an important piece to get just right, since it's going to locate the pedals and steering column. And it's another part of the car that we've been designing for a long time. Our latest iteration is based on measurements taken from a variety of cars that range from a 1997 Miata to a 2002 Miata. If the math is correct and our luck holds, obviously a risky proposition, we'll expect the pedals and steering to work at least as well as the front suspension. I'll third that. What a great blog. Really entertaining. My son and I are busy with a Locost at the moment (Nissan 180sx donor). Home stretch now and I can so relate. Thanks.